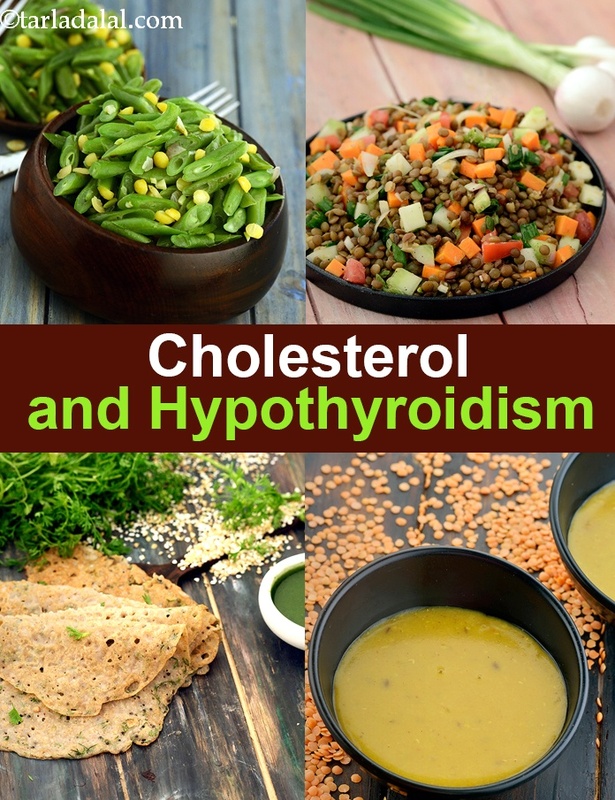 High Cholesterol Hypothyroidism Diet, Thyroid and Cholesterol, Hypothyroidism is a state in which the body doesn’t produce enough thyroid hormones which helps in regulating metabolism, maintaining body temperature and proper functioning of heart, brain and muscles. The major symptoms of hypothyroidism are weight gain, low heart rate, fatigue, dry skin and hair, pain in muscles and also hypercholesterolemia (increased levels of blood cholesterol levels). Thyroid hormone essentially is needed to remove the excess cholesterol from the body. Cholesterol present in our body attaches to a protein to form lipoprotein. This is available in two forms – HDL (High Density Lipoprotein) which is the good cholesterol and LDL (Low Density Lipoprotein) which is considered the bad cholesterol and thus the excess needs to be removed. While diet plays a very important role in the amount of cholesterol present in the body, certain diseases like hypothyroid also leads to high cholesterol levels, especially the LDL cholesterol. Excess amounts of LDL cholesterol in the blood has been known to clog the arteries and lead to heart diseases. Thus it becomes imperative to timely check your cholesterol levels if you already have been diagnosed with thyroid disorder. Along with this, you are also at high risk of becoming a diabetic. Check out how hypothyroid and Diabetes and related. Now the possibility is that once hypothyroid is treated well with medications, the cholesterol levels automatically will be under check. You may not even require cholesterol lowering drugs. This however depends on the intensity of thyroid hormone disturbance. But whether you have high cholesterol or no, being conscious of what you eat will definitely help you to avoid further health complications related to your heart. 1. Amongst the cereals which help the heart and benefit the thyroid both are quinoa, oats and buckwheat. Try using Oats innovatively to create delicacy like Oats Moong Dal Tikki. 2. Whole cereals are the best, but the flours of these grains are also healthier options. 3. Soy and its products like soya granules, soya chunks, tofu etc. also form a part of avoid list as they hinder thyroid hormone production. 4. Try avoiding gluten and check if it helps maintain thyroid levels better. This calls for subtracting wheat, rye, barley, semolina and maida from your pantry. Roti without wheat flour isn’t that difficult to make. Oats Roti is a classic example to prove this. 5. Sugar loaded biscuits, bread, pizza, burger etc. made with plain flour also form a part of NO-NO list. 1. Proteins are your best friend if you are looking for weight loss ingredients to be added to your menu. 2. All types of dals, pulses, lentils and sprouts can be safely consumed. Learn the art of Sprouting Moong. 3. Low fat dairy products will help to achieve weight loss and cholesterol targets both. Learn how to make low fat curds and low fat paneer at home. 4. Egg whites are also healthier protein additions, especially for breakfast. Try the fluffy egg white masala omlette recipe. You will love it. 5. Surrender cheese and its delicacies. 1. Cruciferous veggies like broccoli, cabbage, cauliflower, kale and spinach are best avoided as they are considered as goitrogens. 2. Try and have a control over potato, sweet potato, yam and purple yam too since weight gain is also a subject of concern in hypothyroidism. 3. All other vegetables like ladies finger, brinjal, cluster beans, fenugreek leaves, French beans, carrot, cucumber, capsicum, zucchini, mushrooms, tomatoes etc. are allowed. These antioxidant rich veggies are real heart-friendly ingredients. Mushroom and Green Capsicum Subzi and sprouted moong and methi chila recipe classic healthy delicacies which you are sure to relish. 4. Fortify your diet with fruits like orange, apple, grapefruit, watermelon, papaya, guava, avocado, amla etc, Try flavourful Minty Apple Salad, healthy guava salad and citrus watermelon salad recipe. 5. Avoid peach, pear and strawberry if possible. They might hinder with thyroid hormones. If you are noticing weight gain, control the intake of fruits like banana, chickoo, mango and custard apple too. 1. Have just right amount of salt as excess might increase the chances of heart disorders. Prefer iodized salt v/s non-iodized as iodine deficiency has been known to be a cause of hypothyroidism. 2. Choose olive oil as the high amounts of MUFA (Mono Unsaturated Fatty Acids) in it is beneficial for the heart. Learn to combine your favourite vegetables with a olive oil based dressing. Lettuce Tomato and Cucumber Salad with Basil Dressing and Whole Masoor Salad recipe. 3. Shun away all the junk that comes to your mind. Sweets, confectionaries, cupcakes, canned foods, coffee, alcohol, bread items and of course fried foods too. 4. Cook healthy at home. Prefer pressure cooking, stir-frying, baking (with minimal fat) and steaming over deep-frying and cooking with oodles of oil. We have a tried and tested Baked recipe for your – Baked Masala Sev. 5. Experiment with fresh and dried herbs as a means of flavouring your food. Season foods with curry powder, chilli powder, basil, oregano, parsley, dill leaves, cumin seeds powder etc. Try Bean Sprouts and Suva Tossed Salad which has a touch 2 fresh herbs – dill leaves and basil and Parsley Hummus which combine fresh parsley with kabuli chana. 6. Avoid papads, pickles, canned and preserved foods. 7. Carbonated beverages are pure empty calories which means they only lead to weight gain.Try healthy portions of juice like Papaya and Apple Frappe instead. 8. Eat sensible while dining out. Never leave on an empty stomach. Eat a small portion before leaving. Choose wisely from allowed list at parties too and avoid second helpings. 9. Salad bars like Fruit and Vegetable Salad with Apple Dressing and Minty Bean Salad are always helpful. Chunky soups like Moong Soup are wholesome too than the strained options. Reach out for them. 10. Don’t tamper with your medications and never miss out on your exercise regime. These are twin ladders of your health. Enjoy our High Cholesterol Hypothyroidism Diet, Thyroid and Cholesterol and other thyroid recipe articles below.